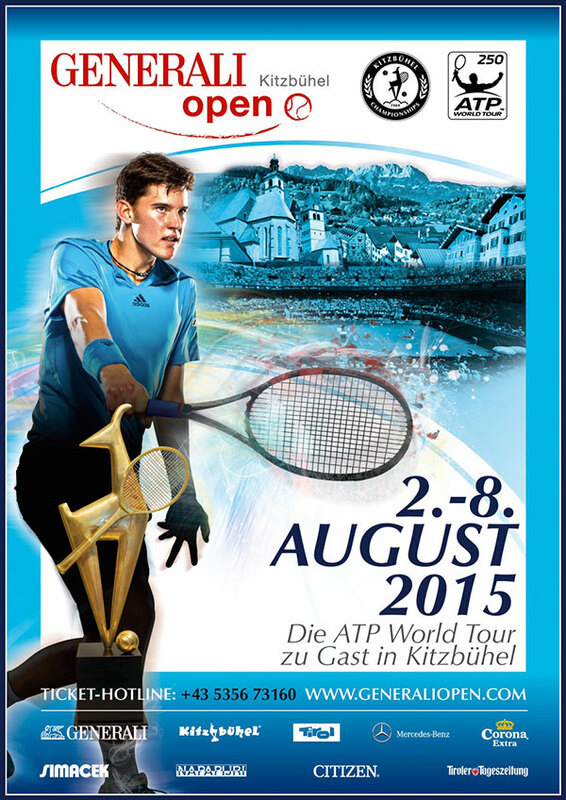 The final ATP clay court tournament in 2015 will once again take place in Kitzbuhel, Austria. The resort town hosts a 250 level tournament as dirtballers vie for a final chance at points and cash on clay. A solid group of clay courters feature in Kitzbuhel, headlined by Austrian #1 Dominic Thiem who has won three ATP titles on clay this year (Nice, Umag, and Gstaad). The fourth career meeting between Struff and Kohlschreiber, the h2h is split 1-1 with Kohli have a win on clay, and Struff on hard court in Doha this year. Struff jut came through qualifying in routine fashion, and is playing his best tennis in months. The 25 year old has always had baseline talent but he tends to struggle under pressure and has shown mental weakness in his career. Kohlschreiber, who is Davis Cup Teammates with Struffi has lost two straight and comes off a round 1 loss to Benoit Paire in Hamburg. He’s normally solid on clay but he’s struggled to be consistent this year, and Struff could catch him in a slump. Kohlschreiber is the favorite though. Monaco leads the h2h with Haase 3-2, and won their last meeting in Gstaad last year on clay (1-1 on clay). That said, the Dutchman is a two-time champion in Kitzbuhel and Monaco is just 3-5 since the French Open, as the veteran Argentine seems to be struggling after having a nice Spring. Haase has been in decent form, and presumably should be rested up for this match. It should be close, but given the venue I see Haase scratching out a minor upset over the seed and reaching round 2. Nicolas Almagro has been struggling since returning from injury, the formerly top tier Spaniard is looking to break a four match losing streak dating back to the French Open here in Kitzbuhel where he is using a protected ranking. The young gun Vesely gave both Fabio Fognini and Rafael Nadal good matches on clay over the past two weeks, and this is an easier draw for him. Almagro is a recognizable name, but Vesely seems to be the superior player right now as his steady play should see him through to round 2. Dominic Thiem is 18-5 on clay this year and has won eight straight matches as he took back to back 250 titles in Umag and Gstaad. He may well be out of gas in front of the home fans in Kitzbuhel, but the Austrian #1 does get a bye and his round 2 opponent will be either a possibly injured Andreas Haider-Maurer, who is also Austrian, or a struggling Joao Souza, a loser of four straight matches. Thiem’s fatigue is a difficult factor to predict, but I still see him reaching the quarterfinals. #8 seed Albert Ramos is a possible benefactor of the fatigue Thiem almost certainly is feeling. Ramos will open with Diego Schwartzman, who has lost six straight matches, and presuming the Spanish veteran lefty wins that either degraded veteran Albert Montanes, a lucky loser, or Gerald Melzer, a home Austrian, will be his round 2 opponent. Melzer is in horrid form like Schwartzman, and Ramos is simply a level above Montanes, thus a Thiem vs. Ramos quarterfinal is the pick. Thiem and Ramos have never played before, and if Thiem is simply in form and not feeling too much fatigue he likely wins, however it’s a hard match to predict and Ramos could also win. Hamburg finalist Fabio Fognini is always a tank risk, especially in a small tournament like this, but if his good form continues he should beat Aljaz Bedene for the second time in as many weeks. Bedene opens with wild card Dennis Novak, and has been in excellent form as of late, that said, he fell to Fognini in straight sets in the Hamburg quarters, after upsetting Roberto Bautista Agut. In the quarters, Fognini could face Kohlschreiber/Struff, or Santiago Giraldo/qualifier Rogerio Dutra Silva. Giraldo beat RDS in Houston this year on clay and comes off of the quarters in Gstaad. Kohli beat Giraldo this year in Umag, but Giraldo won the previous two meetings on clay and may well be in better form, thus I have Fognini over Giraldo in the quarters. Fognini is 1-1 on clay this year against Santi, he beat him in Madrid but lost to him in Sao Paulo. Overall Fognini leads the h2h 5-3 with a majority of their meetings taking place on clay. It’s a tough pick, but if Fognini is committed he should reach the semifinals here. Hamburg semifinalist Andreas Seppi played his way into form on clay with a pair of wins and should cruise into the quarters over either Dusan Lajovic or nearly retired Mikhail Youzhny who hasn’t won a match in over two months. Lajovic is likewise struggling and it’s likely to be a Seppi vs. Vesely quarterfinal. Vesely will have to beat Jurgen Melzer or Daniel Gimeno-Traver after facing Almagro. DGT is in terrible form as a loser of 7 straight, while Melzer is in the twilight of his career but should do his best on home soil. I have a hunch Vesely is a better player on clay than Seppi, as Seppi was 0-4 on clay before Hamburg this year, thus I’m going with the Czech to make a surprise semifinal this week. The other semifinal slot could be filled by Martin Klizan, but he hasn’t been in great form as of late, with a record of six straight losses. Klizan remains 11-9 on clay this year and either Kenny De Schepper or Bastad quarterfinalist Paul-Henri Mathieu will be his round 2 opponent. PHM is in good form, and presuming the veteran has enough gas in the tank I have him upsetting Klizan to reach another quarterfinal, where he could line up across from Monaco/Haase. The winner of Monaco/Haase will face Pablo Carreno Busta or Federico Delbonis. PCB reached the quarters in Gstaad, but both he and Delbonis lost to the same player there, Dominic Thiem, the eventual champion. Look for Haase to fall to PCB, the Spaniard is 2-0 on clay against Robin and just beat him in Gstaad in straights. PHM and PCB have never met, however I’ve been impressed by Mathieu’s form on both the challenger tour and now the main tour, he’s in great form on clay and has always had the talent, thus I have him reaching the semis in what should be a close match. The 33 year old was once a top 15 player and has 4 ATP titles in his career, he’s been in the challenger and qualies wilderness for quite some time, but he appears to be experiencing a resurgence under the radar on European clay. He clearly has the experience to do well here, though mentality is always a question. Look for his solid game to take him to the semis and perhaps even farther. Thiem bageled Fognini in Munich on clay this year, but Fognini is a notorious tanker and is clearly far better than that. It’s hard for me to pick Thiem given how much tennis he’s played over the past couple of weeks, thus I have Fognini reaching his second straight final. Vesely and Mathieu have never faced each other, it’s hard to predict who will perform in the bottom half, but I’m going with the qualifier to pull off a run and reach the final. Fognini should have an edge in talent and form over PHM if this is the final, he’s always an unpredictable competitor, but he has an excellent chance to win his first title of the season and boost his ranking back up this week.